The Center for Health and Risk Communication (CHRC) provides an important organizational framework for stimulating innovative health and risk communication research collaborations, health promotion intervention projects, and community interventions. 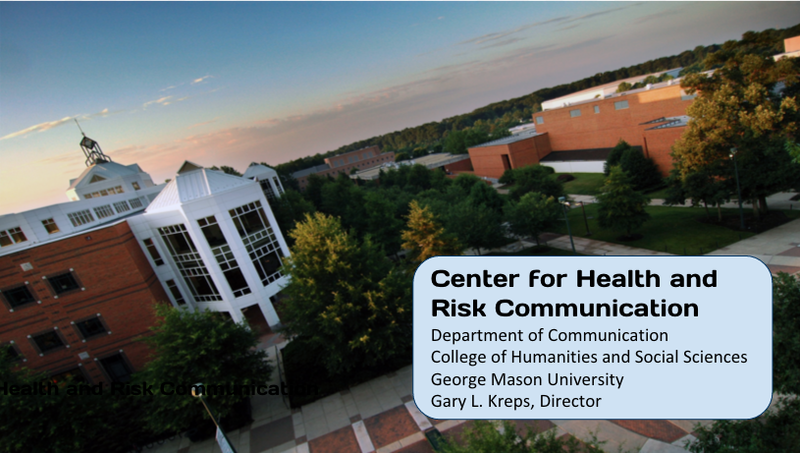 The establishment of the CHRC paralleled the development of innovative new health and risk communication graduate programs at both the Masters and Doctoral levels within the Department of Communication, as well as the development of a strong cadre of distinguished faculty scholars with expertise in health and risk communication. Department faculty have received increased national and international recognition for their scholarship and growing external support for health and risk communication research and educational activities from a variety of government agencies and private foundations. Health and risk communication are areas of great interest and expertise within the Department of Communication and there are growing research and education programs at Mason in this area. Health and risk communication are important interrelated areas of study and application. Health communication examines the communication processes central to the delivery of health care and promotion of health, including health care provider consumer interactions, informed health care decision making, the provision of social support, the development and implementation of health promotion campaigns, and the uses of media and information technologies within the health care system. Risk communication examines strategic communication of serious health and safety risks to relevant publics, government officials, and first-responders, including media management, risk prevention, preparation, and response to health and crisis situations. The Center for Health and Risk Communication (CHRC) provides an important organizational framework for stimulating innovative health and risk communication research collaborations, health promotion intervention projects, and community interventions. The establishment of the CHRC parallels the development of innovative new health and risk communication graduate programs at both the Masters and Doctoral levels within the Department of Communication, as well as the development of a strong cadre of distinguished faculty scholars with expertise in health and risk communication. Department faculty have received increased national and international recognition for their scholarship and growing external support for health and risk communication research educational activities from a variety of federal agencies and private foundations. Active research collaborations have been established with leading health and safety scholars across George Mason University and many other national and international research centers. The Department has served as host for several distinguished international health and risk communication scholars who have engaged in collaborative research while at Mason. The CHRC helps to connect the Department of Communication with a number of relevant external constituencies outside the university, such as the National Cancer Institute (NCI’s) Health Communication and Informatics Research Branch, the NCI Cancer Information Service, the CDC’s National Center for Health Marketing, the AHRQ’s John M. Eisenberg Clinical Decisions and Communications Science Center, the Robert Wood Johnson Foundation’s Health e-Technologies Program, the Coalition for Health Communication, and a number of other important federal agencies and private foundations). There CHRC will be a focal point for plans to establish an innovative new DC-area Research Consortium of Health Communication Programs with collaborations between GMU, Johns Hopkins University, the University of Maryland, Georgetown University, George Washington University, and Howard University. 2006 Sigma Theta Tau International/Hospice and Palliative Nurses Foundation End of Life Nursing Care Research Grant Program, awarded, 2006.